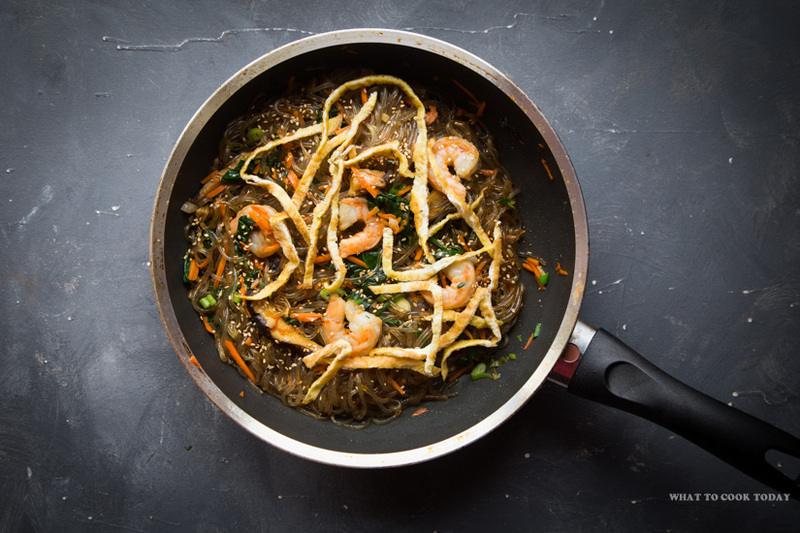 Japchae is a very popular Korean stir-fried sweet potato noodles. 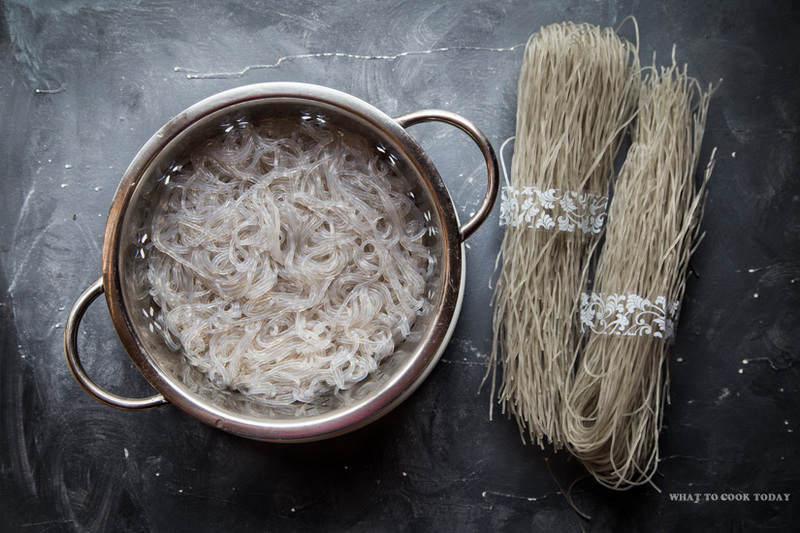 The noodles are round, thick, and almost translucent. 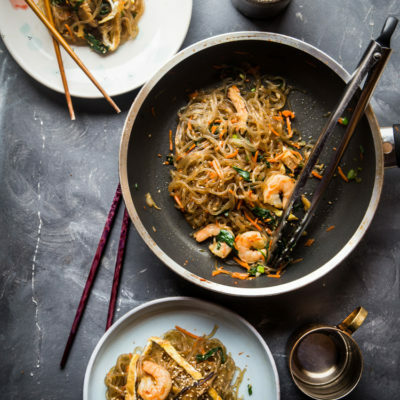 Some call it glass noodles. Perfect for any celebration, potlucks or everyday quick delicious meal. 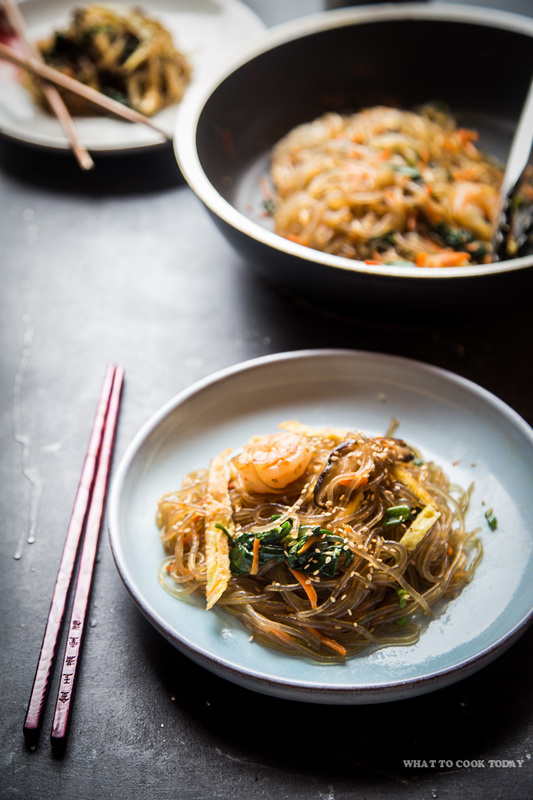 I made Japchae few years ago when I first got the Easy Korean Cooking cookbook by Cecilia Hae-Jin Lee. 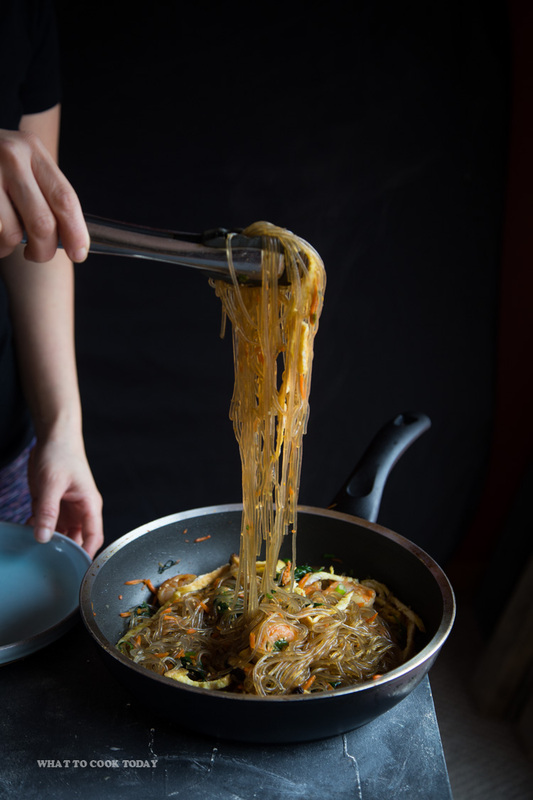 I’ve made it several times since then because it’s our favorite noodle dish. Along the way I’ve modified it just because a dish like this is usually versatile and you can pretty much adapt it with ingredients of your choice. I’ve made Japchae with beef, pork, chicken, and now shrimp. 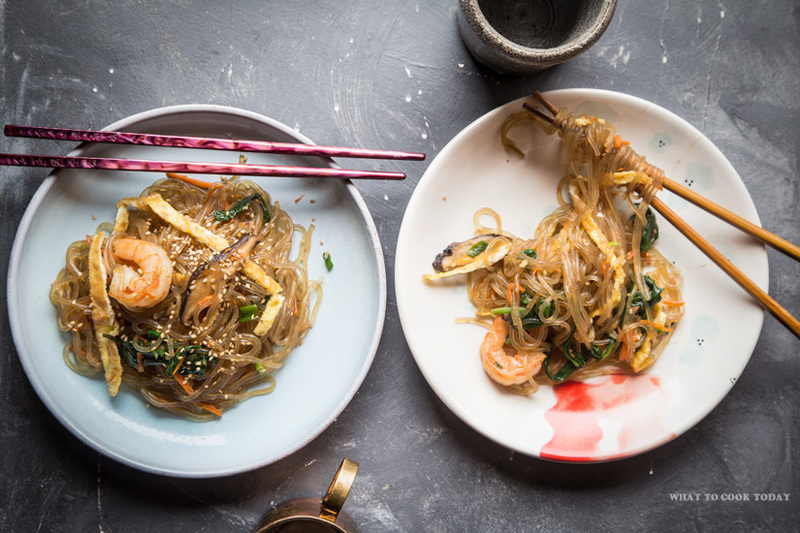 Japchae is traditionally made for parties or celebrations in Korea. 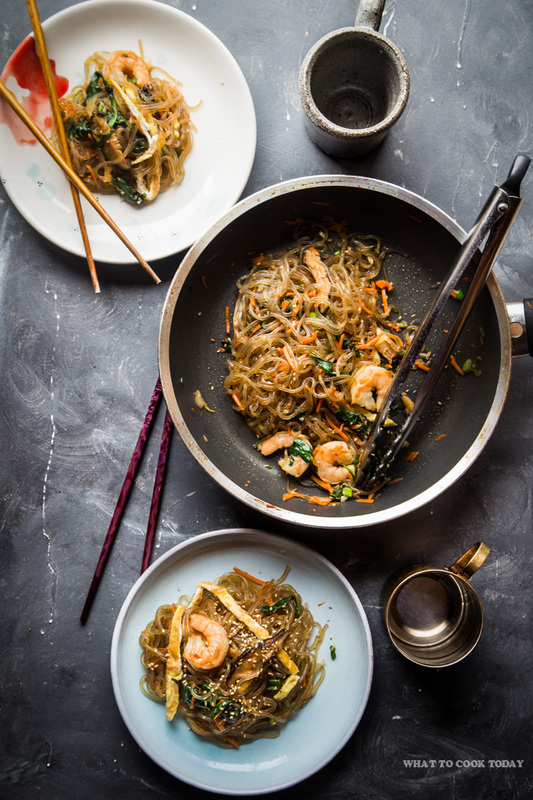 The sweet potato noodles are almost similar to Chinese’ bean thread noodles or cellophane noodles in terms of texture but skinnier. This is a perfect dish you can make for potlucks too. 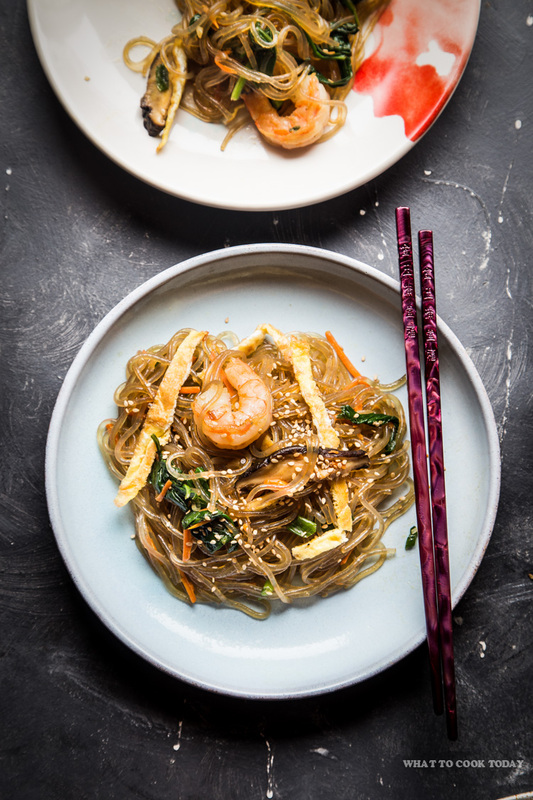 Kids to adult love japchae. My daughter loves this noodle. It was funny that she was eating it like how a real Asian would eat their noodles – with a “slurping” sound by sucking the noodles in lol! My father-in-law is another noodle head (wow…seriously! like there aren’t enough already in this household!) and he absolutely loved japchae when I made it 2 years ago when he was here visiting us. He said, “It’s very smooth”. I guess that explains how easily it is to just “slurp” it in !! If using meat, put the meat in the freezer for about 15 minutes and then thinly slice it and set aside. Yes, I like Asian food very much, in particular, Korean cuisine. Vietnamese and Indian cuisines are also a favourite as is Malaysian and Indonesian food. I lean more toward vegetarian but eat chicken and fish and occasionally eat goat and lamb. I would like to receive, if possible, recipes along those lines. If I can suggest that you browse by category here: https://whattocooktoday.com/recipes You should be able to see recipes grouped by different category. Hope that helps! Thank you for stopping by!